In May 2008, founder Katie Fiumara found herself hearing the devastating news that her father had stage 4 lung cancer. After numerous stays in the hospital and several rounds of chemotherapy, Joe lost his battle to cancer just three short months after his diagnosis. Losing her father so quickly and at such a young age changed Katie forever, but she promised herself that some good would come out of it because she knew that's what her dad would have wanted. Starting with a small memorial golf tournament to raise money for cancer research in her father’s name, Katie became increasingly interested in fundraising and helping the community. She knew that starting a charity would only increase her fundraising potential and impact on others. In 2014, FORE was created to help those fighting the same battle her father fought and provide support for the families and friends who are by their sides. 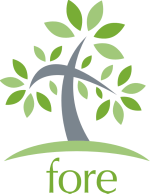 FORE’s name is a play off the golf term “fore”, which speaks to our roots as a yearly golf tournament. But even more, we wanted to empower the community to think, ”what are you FORE,” which gives people the opportunity to take a stand for something and give back to make the world a better place!